It was at a very small, local quilt show that I saw this layout in a wall hanging. It caught my eye as very unusual and striking. I sketched it out and puzzled over it at home. I'm not entirely sure if I had already purchased the batik cat squares prior to that quilt show or if I bought them later with this layout in mind. 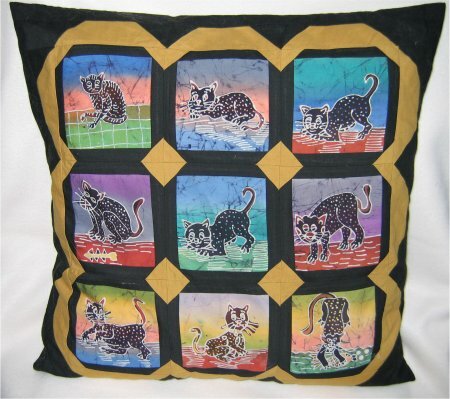 Whichever scenario it was, I like the way the batik cats are set off by the gold border.